Artist's concept of Mars One's envisioned colony on the Red Planet. A new Web TV series follows the efforts of five people who hope to be among the first humans to set foot on Mars. The subjects of the new series, which is called "Citizen Mars" and airs on Engadget.com, aim to become astronauts with the Netherlands-based nonprofit Mars One. That group plans to land four people on the Red Planet in 2027, kicking off a permanent colony there. "There's a tremendous amount of interest in the Mars One project, and many are skeptical about the mission's feasibility, which is why we thought it an important story to tell, and why the subjects involved are so compelling," Engadget Editor-in-Chief Michael Gorman said in a statement. "Citizen Mars" is billed as the first docu-drama to focus on the personal lives of Mars One contestants. It follows five astronaut hopefuls who range in age from 19 to 35 and come from diverse backgrounds. One has a Ph.D. in quantum biology, for example, while another works at a life-insurance company and also plays pro basketball in Egypt. The series launched Tuesday (Sept. 1) and will broadcast five episodes through its run at http://www.engadget.com/citizen-mars/. Mars One's ambitious plans have attracted scrutinty and criticism. In 2014, for instance, a group of MIT graduate students published a study questioning the colonization project's feasibility. The authors went head to head with Mars One representatives at a conference this August, arguing that the cost estimate Mars One has published — $6 billion to achieve the 2027 landing, with most of the funding to be raised by staging a global media event — is too optimistic. 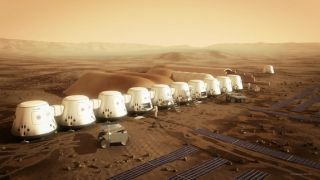 During the August debate, Mars One co-founder and CEO Bas Lansdorp said that the group's plans are still in flux at the moment, and that cost estimates could indeed rise. But, he said, Mars One is committed to putting boots on the Red Planet and is organizing its efforts to meet that overall goal, even if the price tag tops $6 billion.